Late this summer our Priory received a last minute request for a high school theology teacher at a large, inner city high school in Iowa. Since it is relatively close to the small house in Winnebago, we came to see where the Holy Spirit was leading us. After a great deal of prayer and discernment along the way, we decided to accept the offer made by Chris Bork, the principal at Bishop Heelan Catholic High School in the parking lot after our interview, of all places. From that moment in the parking lot, a new relationship between Bishop Heelan and the Norfolk Priory was born. Sr. Pia agreed that I would teach 11th and 12th grade theology classes, and help in other areas of ministry in the school. Quickly I gathered and studied my teaching materials for the courses, and dove in. It has now been two months since school started here at Heelan. I am privileged to teach 135 seventeen year-old students this semester, and will have the 140 18 year-old seniors next semester. Currently we study salvation history, and later my classes will cover social justice. 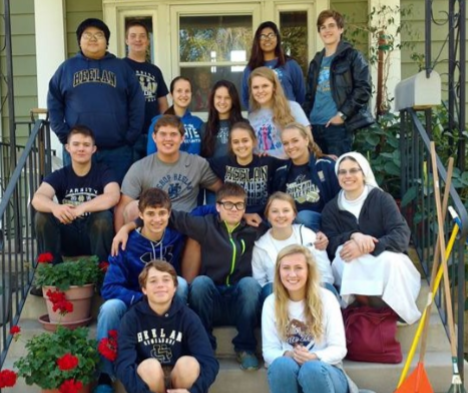 The students are Heelan are joyful, energetic, full of life, and take their faith very seriously. Heelan students live their Catholic (or other faith) authentically and study theology in earnest. While taming the wild waves of their energy can be a challenge, helping them to discover where God is in their lives and what His plan might be for them is very rewarding. Since coming to Heelan, I have had the chance to work closely with our chaplain and diocesan vocation director, Father Shane Deman, who is in his second year as chaplain of Heelan. He brings great wisdom to the community at Heelan while serving as an outstanding role model of the priesthood well lived. Recently we spoke together on vocations at the diocesan youth rally in Spencer, IA to 400+ students. In the spring, Father and I will take 16 students to Chicago and Milwaukee to do service and experience Holy Week together. Next year we are planning an overseas mission trip and a Christmas break trip to Rome, where Father did his studies. We are planning to collaborate on future vocation and discernment events in the Diocese of Sioux City together. By God's grace we have five young women signed up from Heelan to come to a come and see visit to Norfolk, and a growing number of young men joining Father Shane's discernment group. Please continue to pray for many good young people to offer themselves in service in the Diocese of Sioux City and the Archdiocese of Omaha within the Heelan family. All of the teachers, students, and staff count on your prayers for a good school year 2016-17.